Last night was our annual New Beginnings program. It's an opportunity to introduce any soon-to-be Beehives (girls turning 12 this year) to the Young Women program and to reiterate the purpose, goals, and values to those who already are young women. all your heart, might, mind and strength. 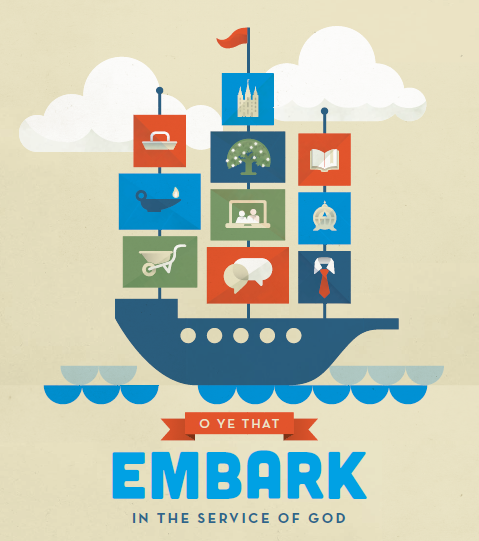 I love the word "embark"! It's such a great word, full of promise and hope and optimism and action. It implies the beginning of a new adventure and reminds me of the scripture that tells us we should "be anxiously engaged in a good cause and do many things of [our] own free will, and bring to pass much righteousness." Young Women should be a time of a lot of embarking, of trying new things, exploring, questioning, stepping outside of comfort zones, setting off on new and exciting adventures. As we "embark in the service of God", I'd like to take a closer look at just what "service to God" entails. Doctrine & Covenants 4 has a reputation as a "missionary scripture" - many missionaries memorize the whole section to provide them with motivation and guidance as they share the gospel - and that's wonderful. But this scripture has a much wider application. President Monson has even specifically said that this section "was not spoken of missionary work alone." So what does "service to God" mean? Any time we are helping to further the purposes of God, we are in his service. And he's told us exactly what his goal is: "For behold, this is my work and my glory, to bring to pass the immortality and eternal life" of his children. Obviously, missionary work counts, and our young women share their experiences talking to their friends about their beliefs during our "missionary moment" every week. The scriptures tell us multiple times that when we serving God's children, we're serving God. So when these young women reaching out to and befriend others, or when they tie blankets for the Vanessa Behan Crisis Nursery like we did last week, they are serving God. Doing family history work and temple work is another opportunity to serve God. Finding those relatives and performing ordinances on their behalf helps further God's purpose and we'll have the chance to do that later this month. One aspect of serving God that doesn't seem to get as much air time is developing our own talents and learning new skills. When we expanding our abilities, we're also expanding the ways we can be an instrument in the Lord's hands. Whether it's learning to change a tire like we did last fall, or learning a little sign language as we did last month, everything we learn increases our abilities to help others and to find joy in life. Finally, I believe that when we grow closer to God, we are serving him. When we pray, study our scriptures, perform those daily devotional acts that draw us nearer to God, we are participating in the work of salvation for ourselves and thus, serving him. In this scripture we're told to serve God "with all [our] heart, might, mind, and strength." Lots of people have shared their thoughts on what it means to serve with those four characteristics. My interpretation is by no means the only one, but these are the thoughts that came to me as I pondered and prepared for tonight. If we realize that love isn't at the center of what we’re doing, it’s worth taking the time to figure out why and how to re-center our motivation on love so we can access the joy that comes from serving with all our hearts. To me, serving God with all our might means we have a mental, emotional, and spiritual toughness and determination. I recently watched a documentary called Maidentrip about a girl named Laura Dekker. She was determined to be the youngest person to sail around the world solo, so she set off about a month before she turned 15 and spent a year and a half on her sailboat Guppy by herself. She set her goal and mapped out her course and a timeline. Along the way, she had to make some adjustments to her plan, due to threats of pirates or bad weather or to make needed repairs to her boat, but she kept her final goal firmly in mind. Likewise, we need to keep our final goal - eternal life with our Heavenly Parents - firmly in mind. We'll need to make adjustments to our plan as we go along in life and unexpected circumstances arise, and our course will look different from the course others may take just because we're all different people. Serving with all our might allows us to "just keep swimming", as Dory says. This is a major focus of the new youth Come, Follow Me curriculum (now in its third year), to encourage the young women to ask their questions, express their thoughts, wrestle with new ideas, and participate in discussions on gospel topics. Think. Express your ideas and opinions respectfully, stay humble, and use the brain God gave you. Talking about serving God with all our strength, I'm going to go in a slightly different direction. We are all human and we all have limitations. I believe that God is able to help us accomplish things that would be absolutely impossible on our own - Philippians 4:13 is one of my favorite scriptures - but he also expects us to be wise stewards of the talents, blessings and resources he’s given us. He does not want us to run ourselves into the ground, and especially not in his name. I can't think of a more intensive season of life than the teenage years. You are all so involved in such good and worthy activities, and this Church asks a great deal of you as well, so be wise. Serving God with all our strength requires that we evaluate for ourselves what the best use of our time and energy is and what activities and assignments we may need to say "no" to for now, in order to have sufficient strength to serve him as he wants us to. Learn how the Spirit communicates with you and use the incredible gift of personal revelation as a tool to help you make wise decisions in how to embark in the service of God with all your heart, might, mind, and strength. Next week we'll be working on Personal Progress for our activity, so I'd encourage each of you to work on some aspect of Personal Progress this week, whether it’s starting an experience, finishing an experience, or moving forward on a project. Those of you who are done aren't off the hook; consider ways you can embark in the service of God, or serve him more a little more of your heart, might, mind or strength. For our soon-to-be-Beehives, I'd encourage you to plan out a path to finishing your Faith in God program before you turn 12 if you haven't already. I'm grateful for you young women, for the Young Women program, and that I get to be a small part of your lives. I'm grateful for the gospel and especially for my Savior who has experienced everything, so I know that I'm never alone. In the name of Jesus Christ, amen. 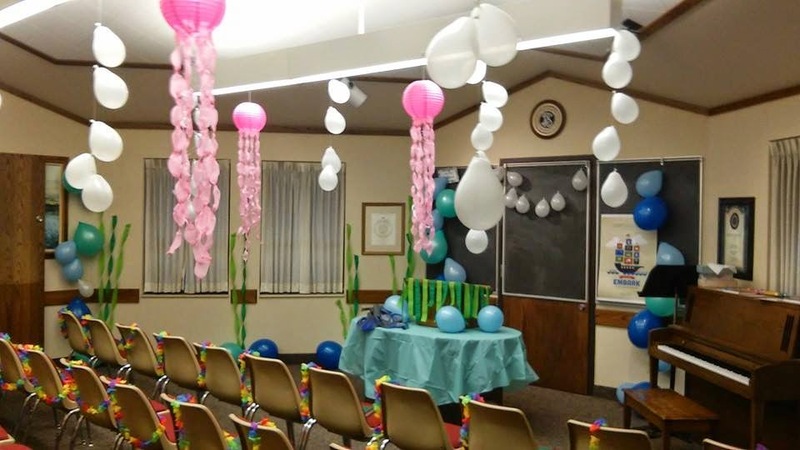 decided on "under the sea" type decorations. Non-crafty me made those pink jellyfish! Aren't you proud? ?